Good-bye two conferences, eight divisions. Hello four conferences. 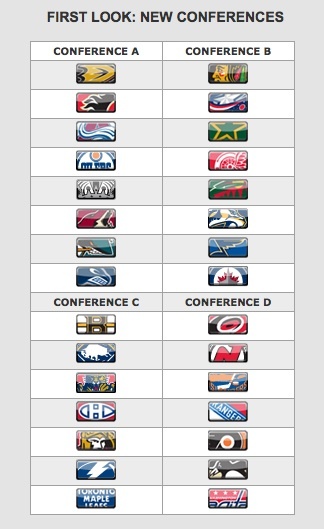 The NHL Board of Governors approved a new look alignment for the league next year. What does that mean for the Capitals? How about a conference that features the Capitals with the likes of the Pittsburgh Penguins, the New York Rangers and Islanders, the New Jersey Devils, the Philadelphia Flyers and the Carolina Hurricanes? Is that more to your liking? While in many ways this would be a dream come true for the Capitals who have argued that they were stripped of some really good rivalries with the Flyers, Rangers and Penguins when they were stashed in the then very weak Southeast Division. Division foes with the Florida Panthers, Tampa Lightning and Atlanta Thrashers seemed to weaken interest in Caps' fans when the move was first made. Since then, some good rivalries have come into place, especially with the Lightning and Caps of late. The overall structure still makes some radical lines drawn mostly in the eastern side of things. 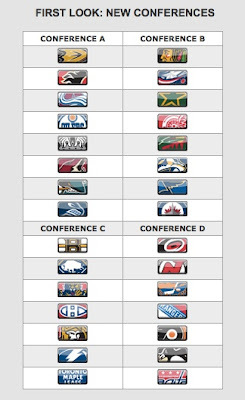 While the travel will be confined and easy for those in Conference D (Caps, Pens, Rags, Flyers, Isles and 'Canes), Conference C stretches over and around the later and includes the Leafs, Habs, Sabres, Bruins, Panthers and Lightning. Almost a blueprint from taken from the Final Four's Elite 8 to give a comparison.